Water injection pumps are used to extract oil and gas resources offshore. The operating pressure of these pumps increases with reservoir depth. Impellers must withstand a pressure of 1’000 bar (100 MPa) and 60’000 load cycles per minute. To improve the reliability of pumps, Sulzer’s materials and processing specialists are constantly investigating which materials and process technologies are most suitable for use in the future. There are invisible differences between pumps, but they influence the long-term availability of the pump. The material used for the pump impeller or pump casing has a big influence on its resistance to stress or corrosion. Every day, newly developed materials are available for additive manufacturing processes and allow manufacturers to go new ways in production. Soon, the smart use of process technologies and materials will be one of the keys to offering competitive products for the market. The best material is not the only decisive factor — the most suitable material and process counts. In some cases, delivery time matters most — then a faster production process wins. For corrosive or aggressive pump fluids, improved material properties with coatings, or higher resistance to chemicals win the evaluation process. Exploring and extracting oil and gas resources from offshore reservoirs forces the oil and gas industry to stretch its limits. More and more water injection pumps are used in deep- or ultra-deepwater. The deeper the oil and gas resources are, the higher the fluid temperature of the pumped fluids is — a geothermal effect. Also, the deeper the pump is operating, the more corrosive substances in the injected water there are. In the early 1970s, the discharge pressure of water injection pumps was around 350 bar (35 MPa). In 2001, Sulzer set a world record by installing four HPcp pumps in the Gulf of Mexico. These pumps operated with a discharge pressure of 605 bar (61 MPa). Anticipating the rising requirements, Sulzer launched a concept study in 2009 to develop an injection pump with an operating duty pressure of 800 bar (80 MPa). The customer feedback to this project set the development benchmark higher, and Sulzer developed a pump providing 1’000 bar (100 MPa) of operating pressure (Fig. 1). Fig. 1 Evolution of the discharge pressure for water injection pumps from 1970 onwards. How is it possible to achieve such a pressure increase? Partially, by adding pump stages, but mainly by defining a higher head per stage. These changes increase the mechanical stress on the materials used in the pumps. Usually, super-duplex stainless steel is used as the pump material for high-pressure pumps. But with a pressure of 1’000 bar (100 MPa), the mechanical limits of this steel are reached. Besides smart engineering solutions, subsequent pump developments will require improved materials, which provide higher strength with the same or even improved corrosion resistance. However, these materials are not easy to find because material strength and corrosion resis­tance generally oppose each other. A challenge is to find appropriate impeller materials, because these components cannot be executed like a pump casing in high-strength low-alloy steels clad with a corrosion- and wear-resistant stainless overlay. Beside strength and corrosion resistance, the fatigue resistance of the impeller material is the key to success, because these components are already nowadays exposed to a very high number of load cycles. In a common diffuser-style pump, each impeller vane passes approximately ten diffuser vanes per revolution. Each pass causes a pressure peak on the impeller, which leads to a small elastic deformation of the part (Fig. 2). Fig. 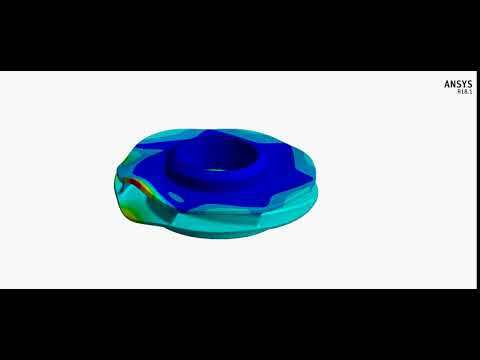 2 Simulation of impeller deformation under partial load conditions by FE analysis. See a simulation video of impeller deformation. Fig. 3 Comparison of yearly cycles and beats in different areas. If the pump spins at 6’000 rpm, the impeller will have 60’000 load cycles per minute. Just some comparison values: an average heart beats 90 times per minute and a car engine runs at 3’000 rpm. For the pump, a year (or 525’600 minutes) of continuous operation results in 31.5 billion (3.15 x 1010) cycles (Fig. 3). To meet the future demands of high-energy pumps, Sulzer is always looking ahead, and evaluates and tests new materials and process technologies. Aware that the pump material is of vital importance, Sulzer employs a dedicated team of 18 materials specialists in its Pumps Core Technology Materials department. Modern materials selection is objective, a fact reflected in the quantified selection for an impeller material that is stronger than cast super-duplex stainless steel, but at least as corrosion-resistant. Quantifying the two critical material properties becomes easy in a database, but there are limits. Strength correlates well with the resistance to fatigue crack initiation. However, a need for correlations arises because there is more data for wrought rather than cast versions. To estimate and judge the resistance to pitting corrosion, the materials engineers use the pitting resistance equivalent number (PREN = Cr + 3.3 Mo + 16N). PREN is an index made up of a linear combination of weight percentages of key chemical elements. Nevertheless, performance optimization using the two main properties across all database materials becomes clear in a graph. The circles in Fig. 4 represent the range of properties for a specific material, with super-duplex highlighted as No.1. Bubble positions show relative performance with equality given along a diagonal line and best performance toward the upper-right in this graph. The material with the most promising potential is a special nickel-based alloy (No. 2). The quantified material selection, therefore, reveals that there are only a limited number of alloys with better performance than super-duplex stainless steel, with only one offering most promise, a nickel-based alloy. Fig. 4 Strength-corrosion selection chart. The selection of material processing is qualitative and simpler than material selection. Wrought or worked materials are known for relatively favorable mechanical properties, but only a single issue immediately disqualifies these. There is no further consideration of wrought materials because there are no tools to machine the complex cavities of a closed impeller. Likewise, joining of multiple wrought pieces introduces serious risks to fatigue resistance. The most suitable remaining modern and traditional processes carry both advantages and disadvantages. The table (Fig. 5) reviews these process pros and cons. Note that 3D printing using laser fusion essentially builds parts from multiple miniature castings. As a result, there are inevitable solidification discontinuities and residual stresses. Therefore, vacuum investment casting takes preference because of availability and competitive cost, and it is a proven production route for precipitation hardening nickel-based superalloys. Vacuum investment casting is a three-dimensional replication process that involves a few steps before producing the metal impeller. First, a sacrificial pattern or copy of the impeller is 3D-printed from a low-melting-point plastic, and then this pattern is coated with multiple layers of ceramic slurry. After placing the coated pattern in a furnace, the plastic burns off and the ceramic slurry forms a rigid, yet brittle and empty, mold or container. That container is also sacrificial, for the molten metal to solidify, or invest, within. Third, the molten and reactive metal is poured into the warm ceramic mold under vacuum to avoid contamination. Finally, the metal inside solidifies, and the cast impeller is revealed by destroying the brittle ceramic mold. These basics of investment casting have ancient roots. Archaeologists claim that the use of beeswax patterns and clay molds is thousands of years old. The current process, vacuum investment casting, is contamination-resistant, and even incorporates modern methods such as the 3D-printed plastic patterns. Heat treatment tackles two specific factors in the statistical distribution of material strength, resulting in improved reliability with respect to the distribution of applied stress. Note that there is natural order for a scatter, or distribution, in strength and stress instead of single values. Hot isostatic pressing, as characterized in the table in Fig. 6, affects the scatter in the fatigue strength. Fig. 6 Advantages and disadvantages of hot isostatic pressing (HIP). Fig. 7 Narrowing of scatter in strength from hot isostatic pressing and mitigation of internal material stress. The range of scattered fatigue strengths is narrower after applying hot isostatic pressing (HIP) which increases reliability (see Fig. 7). HIP is like a large pressure cooker. It takes place at 1’200 °C near the melting point of the metal and lasts for at least three hours. During HIP, inert argon is used to build 1’000 bar (100 MPa) pressures that close internal casting voids, which would otherwise degrade fatigue cracking resistance. This extreme pressure approaches the pressure in the Mariana Trench, which is the deepest-known natural part of the Earth’s oceans (approx. 11 km / 6.8 miles below sea level). Fig. 8 Average increase in material strength by precipitation hardening (PH). A second heat treatment process improves reliability by increasing the average fatigue strength. With average applied stresses increasing from deeper oil fields, solution annealing and precipitation hardening under vacuum increases average material strength to reduce the chance of failure (see Fig. 8). There are added measures to control the strength distribution. Management of the internal or residual material stresses, which continues throughout the process, reduces strength variation. Since the alloy is compatible with slow cooling, Sulzer uses controlled inert gas cooling instead of quenching. Hot isostatic pressing and controlled precipitation hardening, therefore, improve reliability by resulting in a narrower distribution of material strength with a higher average. Fig. 9 X-ray computed tomography of an impeller cross section, done by the Central European Institute of Technology (CEITEC CTLab), Brno, Czech Republic. Inspections of new processes and products are necessary to maintain reliability since no production process creates flawless parts. The goal is to limit or prevent faults from becoming defects. During non-destructive testing, the prototype impeller castings showed promising results. The surfaces underwent visual, metrological, borescope and fluorescent liquid penetrant inspections for cracks and discontinuities. The complex volume of the castings makes interior inspections demanding. Only the accessible areas in the interiors of the impeller could be inspected using ultrasound. X-ray computed tomography, much like scanning a human body, complemented the ultrasonic inspections of the interior. An example of an acceptable X-ray computed tomography cross section is shown in Fig. 9. It shows how dense the material is after hot isostatic pressing. Reliability makes use of empirical and material performance models. Quantifying impeller reliability depends heavily on materials science and engineering, fracture mechanics, and statistics due to the probabilistic physics of failure approach. For this, the fatigue and fracture mechanics properties are critical. Robust and adaptive Bayesian statistics will be applied to the results of the many ultrasonic fatigue crack initiation tests. Ultrasonic fatigue refers to an accelerated test, specifically using cyclic loading frequencies near 20 kHz instead of 20 Hz, to extend stress-life curves from the megacycle into the gigacycle domain. Note that gigacycle fatigue testing of steels has shattered earlier assumptions of infinite life and fatigue limits. Other tests measure flaw, damage and environmental tolerances. Therefore, testing and reliability physics are crucial to the development and design of the pump impeller. Destructive testing of prototype parts during the material selection and processing is indispens­able. Determining mechanical and corrosion properties and characterizing the microstructure can only be achieved with destructive testing. Sacrificing many representative coupons and a few full-size impellers is part of the evaluation process. The test results of the new material and the new process with hot isostatic pressing are encouraging. Numerous metallographic cross sections without pores or microscopic shrinkage cavities confirm the quality of the casting and the effectiveness of HIP. Interim tensile tests show a strength improvement factor of 1.4 over cast super-duplex stainless steel.